In a hurry? Buy today and we can dispatch the very same day. The best halogen G9 replacement yet. 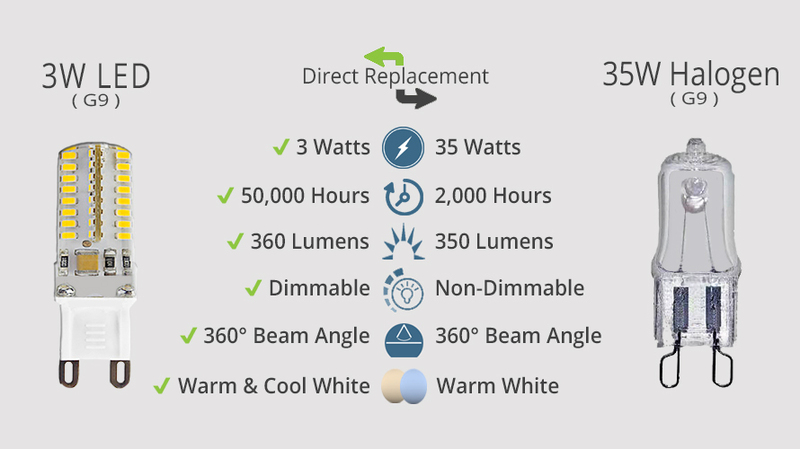 With a bright light output of 360 Lumens and offering a full spread of light, replacing your 35w incandescent G9 LED bulbs have became one of the easiest choices you can make. As these G9s use only 3 watts of power, you can make savings of up to 90% on your energy bills. Why stop at saving money on your bills? You can also benefit from our bulk buy offers and get an extra 5% off of the price when you buy 5 or more at once. On top of these savings, our full range of G9s also apply to the wide range of discount codes that are consistently ran on our website. With these savings combined, you can make up to 25% off of your order value before the items have even left us! The SlimLED range of light bulbs has had some great improvements. Moving on from their old ways, these bulbs are slimmer, so they can fit into smaller fittings. They have been made much more energy-efficient, with a greater ratio of light produced to energy used than ever before. They also have longer lifespans, thanks to more effective heat sink technology. Featuring 64 small, high power LEDs the G9 3w is the best replacement for 35w incandescent G9 light bulbs. Featuring a full spread of light reaching 360° and available in Warm White (3000K) and Cool White (6000K) you will definitely be able to find somewhere to install them. Warm White is the colour that is closest to traditional incandescent light bulbs so it makes it the best choice for most situations. The main use for Warm White is mainly used within living areas such as living rooms and dining rooms. It is also used very frequently in bedrooms and hallways due to its warmer colour. Traditionally styled rooms also use Warm White a lot as it works very well with the decor within the room. The other colour option available, Cool White, is used in most other areas of the house but mainly within the bathroom and kitchen as they require for more light. It is also used within offices due to its bright colour. Cool White is also the colour that is recommended for rooms that have a lot more to a modern feel to them. If you are still unsure on the colour you would like and are having difficulty choosing then have a look at our Colour Guide for LEDs. Newly available with a dimmable option, you will be able to set the mood in your house like never before. With both colours available in dimmable, any situation can have develop a completely aspect. If you are looking to have your LEDs dimmable, then you will need a dimmer switch that is compatible with LEDs. Like all of our Mirrorstone Lighting products, our full range of G9 LEDs come with a 2 year warranty as standard. This warranty can then be extended up to 5 years free of charge. This warranty extension is, however, only applicable to the full ranges of LED spotlights, LED light bulbs and LED tape items. As you can never be sure on colours and beam angles, we offer a 28 day returns period on all of our products, excluding cut to length LED tapes. If you do require to return your item, or have any questions about colour temperatures, beam angles, wholesale prices or anything else then please feel open to contact us either by telephone on 0116 321 4120 or e-mail us at cs@wled.co.uk. These lights are the bomb, proper bright, massive improvement in the previous filament type. Very quick service in delivery too. The bulb appears well made and robust, but flickers a lot, particularly when dimmed, and the light is much whiter than I had hoped, and not exactly "warm white"